Kurta and farshi pant bottom set. Pure chanderi yellow kurta with lopp buttons, jute highlight on bell sleeves, 2 side pockets and lining inside. Bottom pant is kota silk thread embroidery ivory farshi pant with elasticated waist and lining throughout. 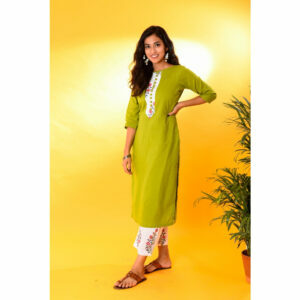 Kurta can be worn as a dress without any bottom for a contemporary look. Dry Clean only.